Immerse yourself in the fascinating history of Marrakech at Les Jardins de la Medina. This boutique hotel, part of the Châteaux et Hotels Collection, captures the soul of this enthralling city and offers guests the chance to experience an authentic Moroccan riad. Located in the heart of Marrakech’s medina and close to the Royal Palace and other famous landmarks, this hotel is a true oasis of calm in the vibrant hub of the city. Set within the walls of a traditional building, Les Jardins de la Medina has an outstanding reputation for personal service and has even been awarded the certificate of excellence in 2017 by Hotels de Charme and Caractere. Retaining its original 19th century architecture, this hotel combines modern luxury and elegant exoticism. A beautiful garden surrounds the contemporary rooms and suites, which can be found among the beautiful foliage of jacarandas, old olive trees and other luxurious plants. The garden offers a secluded spot away from the bustle of the city streets; relax by the tranquil water fountain during the day or admire the stars under a cosy blanket come evening. Plus, guests can discover an outdoor pool within the stunning grounds. For total relaxation, the hotel’s well being centre provides a Middle Eastern themed sanctuary of relaxation. Enter the former reception hall of the riad and marvel at the historic Moroccan architecture. Serving food throughout the day, dishes are made using the finest local ingredients. 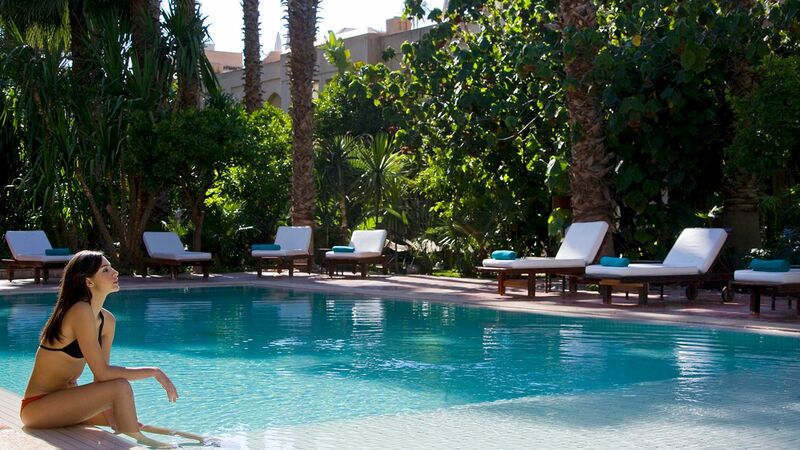 Set within the stunning exotic gardens, the hotel’s outdoor pool offers an oasis of calm and is the perfect place to soak up the gorgeous Moroccan sun. Rejuvenate the mind and body at the well being centre. Indulge in an Argan oil massage, treat yourself to a relaxing facial or take advantage of a classic Middle Eastern treatment. Learn to cook Moroccan cuisine at one of Marrakech’s most prestigious cookery schools, which is located on the hotel’s rooftop. Master authentic dishes and experiment with exotic spices. Marrakech is a city like no other. Steeped in history, tourists come from far and wide to marvel at the vibrant colours, rich aromas and fascinating architecture. Set against the backdrop of the snow-capped High Atlas Mountains, the bustling streets of Morocco’s cultural capital are a feast for the senses. A kaleidoscope of colours line the walkways; from deep reds to golden hues and everything in between, while the delicious aromas of Moroccan cuisine flow from the many food stalls. A fusion of African and Arabic culture can be discovered in the heart of the city at the central medina, where tourists can browse the many souks for Moroccan treasures to bring back home. The exotic buzz of the city is further amplified by the many street entertainers, from snake charmers to belly dancers. Yet, behind elaborate gates and painted doors lie tranquil courtyards where visitors can discover an oasis of calm. 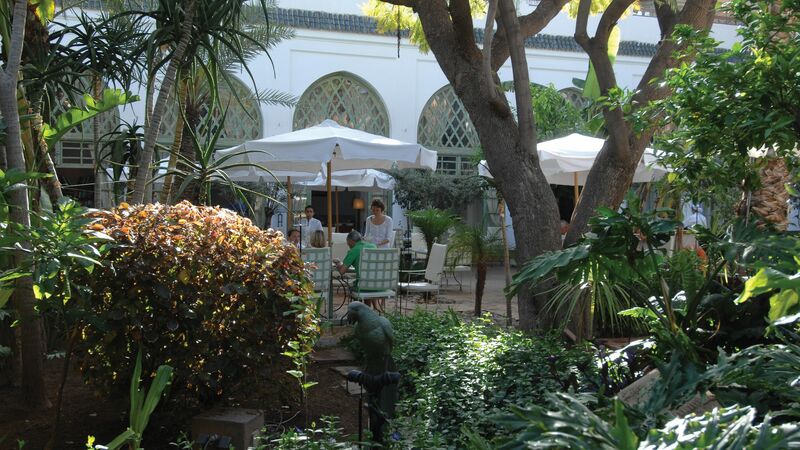 Les Jardines de la Medina is 20 minutes from Marrakech Airport. Superior Patio View Rooms are arranged around courtyards of fountains, jasmine, orange or palm trees. Superior Garden View Rooms offer very pleasant views in both summer and winter and are located on the garden side. Les Solarium Rooms open out onto a small pergola and a staircase leading up to a large private terrace with a solarium. A group of seven suites, Les Sultanes are named after renowned women. The stylish suites have a terrace or balcony with views over the beautiful gardens. They offer either a large bath or rain shower and most also have a fireplace. This hotel is in a perfect location and the grounds itself are lovely. There is a lovely courtyard garden and a rooftop terrace with wonderful night views. The restaurant was fantastic. Our room was well appointed and the beds were comfortable. I would return to this hotel again and recommend it to others. This was our first stay in Marrakech and the hotel was a very good decision. The location is very well situated and the hotel with it?? ?s wonderful garden is a small oasis. Only the quality of the breakfast and the service for coffee/tea should be improved. We cannot praise the staff of Les Jardins enough. Without exception they were friendly, attentive and willing to go out of their way to make our stay such an enjoyable one. The room we had was lovely, with a balcony overlooking the garden and pool. The restaurant was excellent, both for poolside lunches and evening dinners. The Hamman and massage were a pleasure. Given the bustle of Marrakesh outside, it was a delight to return to such calm and efficiency. We hope to visit again. Unlike normal hotel, they treat honey moon seriously, when you enter your room you will see roses every where and candle light all over the room, very sweet and amazing experience, and they also have singer while you are having your candle light dinner, quite amazing experience. Highly recommend.